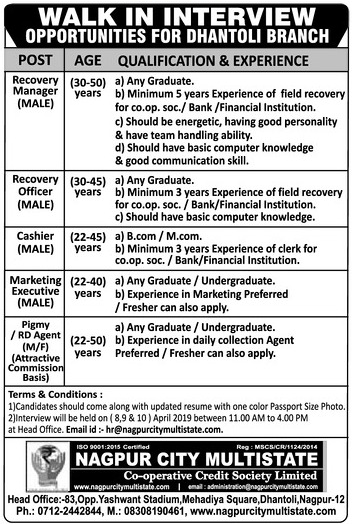 Nagpur City Multistate (Nagpur City Multistate Cooperative Credit Society Limited), Nagpur published a new job notification for Recovery Manager, Cashier, Marketing Executive, Pigmy /RD Agent Posts. The willing candidates are informed to see the latest notification April 2019. Qualification required Graduate/Under Graduate/B.Com/M.Com and More. Walk-in Interview on 08,09,10 April 2019. For More details of Nagpur City Multistate Recruitment 2019 Read Below. Education Qualification: Graduate/Under Graduate/B.Com/M.Com and More. For Post wise Education Details follow the detailed advertisement. Interested & Eligible candidates may attend for walk in interview along with all the documents addressed at Nagpur city multistate Main Branch : 83, Mehadiya Square, Dhantoli, Nagpur-440012. Walk-in Interview On: 08,09,10 April 2019.